Matthew Apgar - mapgar@shawmedia.com Dave Morrison of Crystal Lake takes Cassie, his 3-month-old female golden retriever puppy, outside on Sunday, Jan. 31, 2016 in Crystal Lake. Morrison was given the puppy as a surprise early birthday gift from his wife Marie, who got the idea upon seeing Cassie's sister, Sadie, at a Christmas Eve dinner at their neighbor's house. Matthew Apgar - mapgar@shawmedia.com Christian Deters, 9, left, and Abby Deters, 11, both of Wilmot, WI, play with Cassie and Sadie, three-month-old golden retriever sisters, on Sunday, Jan. 31, 2016 at their grandparents' neighbors residence in Crystal Lake. Sadie is owned by their grandparents, Rob and Stacy Shelley, while Cassie is owned by Dave and Marie Morrison, neighbors of the Shelleys. Matthew Apgar - mapgar@shawmedia.com Megan Shelley of McHenry walks behind Cassie, front, and Sadie, three-month-old female golden retriever sisters, as they are taken outside to relieve themselves on Sunday, Jan. 31, 2016 in Crystal Lake. Matthew Apgar - mapgar@shawmedia.com Dave Morrison carries his puppy, Cassie, into his home as Megan Shelley of McHenry, daughter of neighbors Stacy and Rob Shelley, carries the Shelley's puppy, Sadie, inside on Sunday, Jan. 31, 2016 in Crystal Lake. The two female golden retrievers are 3-month-old sisters from a breeder in Grand Rapids. Matthew Apgar - mapgar@shawmedia.com Megan Shelley of McHenry wipes off the muddy paws of Sadie, her parents' three-month-old female golden retriever puppy, on Sunday, Jan. 31, 2016 at the neighboring Morrison residence in Crystal Lake. Megan have Sadie to her parents, Rob and Stacy Shelley, for Christmas. The Shelleys hosted a Christmas Eve dinner with neighbors Marie and Dave Morrison when they saw the puppy, prompting Marie to contact the Grand Rapids breeder about purchasing Sadie's sister, Cassie, as a surprise early birthday gift for Dave. Matthew Apgar - mapgar@shawmedia.com Marie Morrison cleans up excrement deposited on the floor by Cassie, her new, 3-month-old female golden retriever puppy, on Sunday, Jan. 31, 2016 in Crystal Lake. 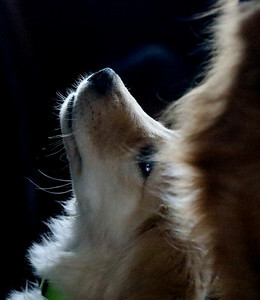 Matthew Apgar - mapgar@shawmedia.com Cassie, a 3-month-old female golden retriever, looks up while tempted with treats on Sunday, Jan. 31, 2016 in Crystal Lake. 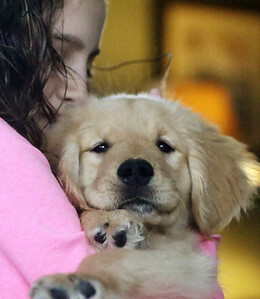 Matthew Apgar - mapgar@shawmedia.com Abby Deters of Wilmot, 11, holds her grandparents' three-month-old golden retriever puppy, Sadie, on Sunday, Jan. 31, 2016 in Crystal Lake. Matthew Apgar - mapgar@shawmedia.com Cassie and Sadie, both 3-month-old female golden retrievers, chase each other around the Morrison's home on Sunday, Jan. 31, 2016 in Crystal Lake. 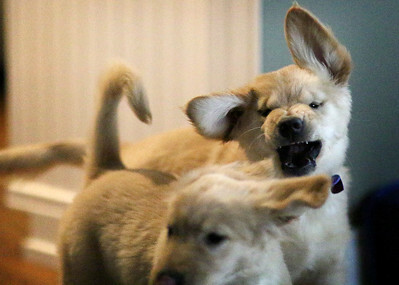 Cassie and Sadie, both 3-month-old female golden retrievers, chase each other around the Morrison's home on Sunday, Jan. 31, 2016 in Crystal Lake.